Treadmill Ratings Reviews / Blog / Blog / What Kind of Treadmill Shock Absorption is Best? What Kind of Treadmill Shock Absorption is Best? There are several options for treadmill shock absorption across the major brands. It’s important to find a machine with the right level of cushioning to match your running style. Quality shock absorption will help protect your joints and save you from a great deal of pain over the long term. Most models out there are going to use elastomer shock absorption with rubber grommets positioned underneath the running surface. These marshmallow looking grommets can vary in size along the length of the treadmill. For example, Horizon Elite T7 has larger grommets in the front to absorb the foot fall and smaller grommets in the back to provide a solid and stable push-off point. 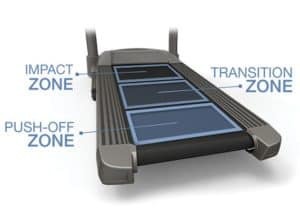 If you prefer a stiffer running surface using this technology you might prefer Sole Treadmills. Our tests show that these machines are quiet comfortable. They are perfect for road runners who are taking a break from the pavement. Our favorite Sole machines are the Sole F80 and Sole F85. Bowflex is relatively new to the treadmill industry, but they break into the game with their 5-Cell Comfort Tech Cushioning. These machines are designed to be low impact and allow for a surface 25% softer in the front to absorb your footfall. Honestly, this is similar to the variable cushioning that you’d find on the Horizon and Sole machines. NordicTrack and ProForm are built by the same parent company called Icon Fitness. Their shock absorption acts like the suspension system on your car with external springs and an internal elastometer. The deck cushions each step and then propels you into your next step with energy return. Some of these machines can simulate both road and off-road running surfaces. 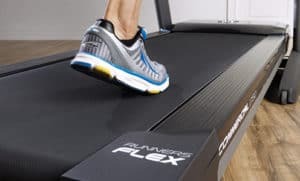 For example, the NordicTrack Commercial 1750 has Runner’s Flex cushioning with six dampeners along the running surface. You can turn this on or off depending if you want a softer or harder surface for training that day. Cheaper treadmills are going to have decks that angle outwards. This causes your foot to twist slightly with each footfall. Avoid this type of deck as it can cause injury over time. Many of the cheaper brands also skimp on overall cushioning. The machines are so lightweight that the entire frame shakes while you run. The impact of your footfalls isn’t properly absorbed. We always recommend that you stay away from these cheap machines. You’ll be doing your body more harm than good.